There is nothing wrong with being a seamstress. However, there is everything wrong with telling girls that it is the greatest height they will ever achieve. By focusing capacity building and “women’s empowerment” programs solely on low-skill (and therefore low-wage) jobs, women are inadvertently trapped within the poverty cycle. 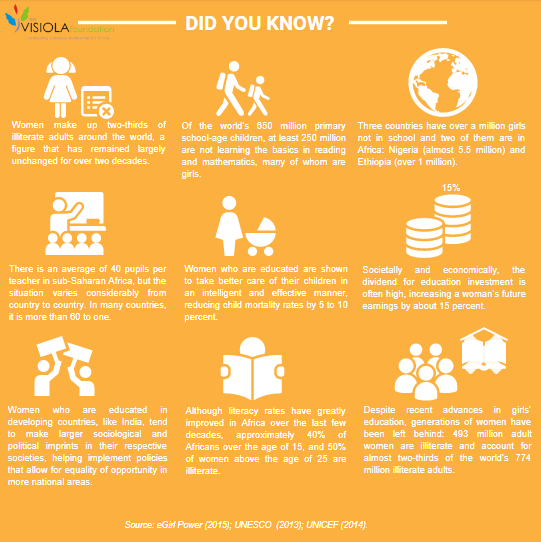 It is little wonder that women in a number of African countries only attain a percentage of the human development outcomes of men, as reported in the United Nations Development Program’s annual report. This approach will do little to drive industrialization, job creation, or shared prosperity. Instead, there should be concerted efforts to teach young people (and girls in particular) independent thinking and the application of science and technology to everyday life. Girls should be equipped with the technical skills that will allow them to create and innovate. They should be taught so that they acquire in-demand, globally significant and adaptable skills that will enable them to access high-wage jobs, today, and in the future. This model will facilitate the type of economic transformation that solves problems and improves social outcomes. Therefore, instead of handing out sewing machines and bead-making materials, let’s hand girls technical expertise and marketable skills such as computer programming and applied science. Moreover, we must make innovation attainable. A number of global innovations were created by average men and women who tinkered, iterated, and eventually created something amazing. Oftentimes, their mission was to solve a basic challenge and they ended up disrupting entire industries. African girls should know that this is a realistic aspiration for them. They should equally be encouraged to tinker, iterate, and eventually develop awesome inventions. The assumption that intellectual ability and creativity are directly correlated with economic privilege is preposterous. Case studies from around the world demonstrate that intellect is gender and environment neutral. We have seen children living in decrepit villages without formal education build machines (notable among them is William Kamwamba from Malawi, who, at the age of 14 built a functional (power generating) windmill using scrap materials found in his village). We strongly believe that there are millions more of such innovators across Africa, whose potential needs to be nurtured and unleashed. 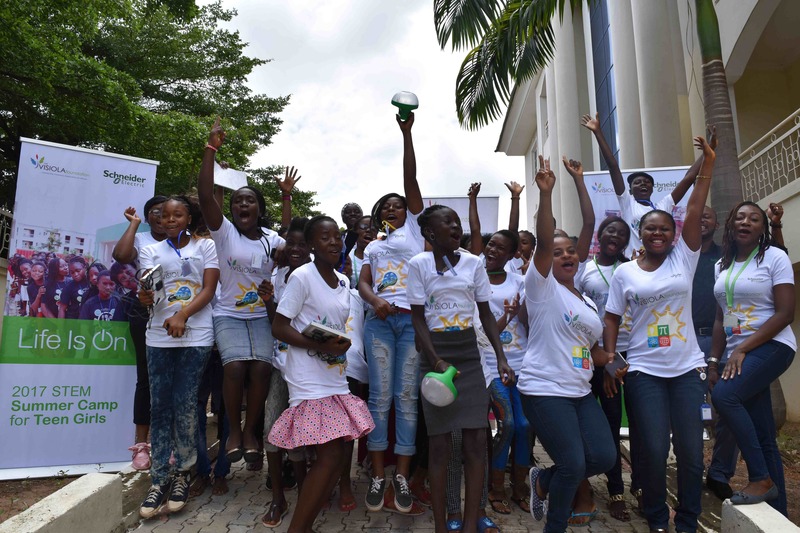 If more girls knew that their communities believed in them, and that with some training they could hone their skills to become problem solvers, we would have many more innovators working to tackle Africa’s development challenges, at the grassroots level. Let’s therefore make the notion of “try, fail, adjust, repeat” the mantra. Finally, we want the billion-strong population to become a formidable force for creativity and innovation. We want African markets to also become producers and creators of new technologies. In this way, Africa will be able to participate fully in the global economy and will be able to move up the value chain, instead of remaining a low value-adding consumer and trader of foreign goods and services. We had an eventful third quarter. Thanks to a generous donation from the Google Corporation, we ran our annual Summer Coding Boot Camp and taught 50 young women how to code in various programming languages. Farida and Rebecca, graduates of the 2017 Summer Coding Boot Camp share their journeys in computer programming and how they secured jobs after the camp. 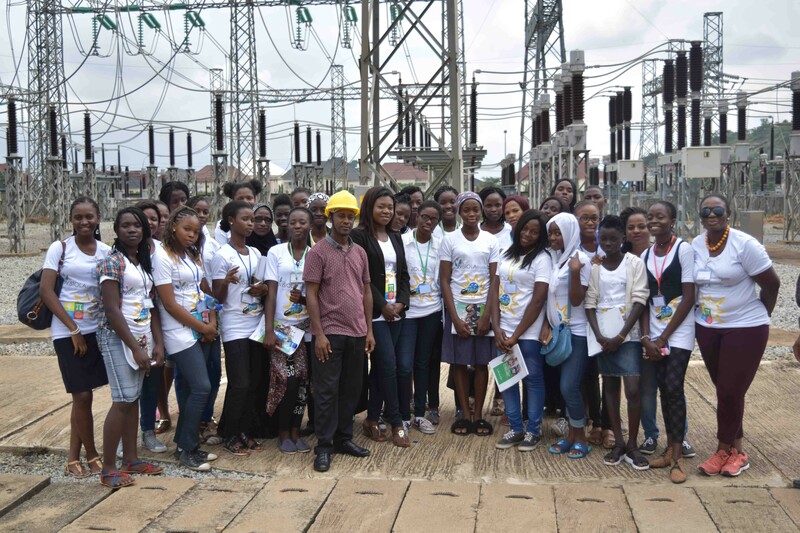 With our Headline Sponsor, Schneider Electric Nigeria, 30 teenage girls learned about Renewable Energy and built various power generation prototypes. 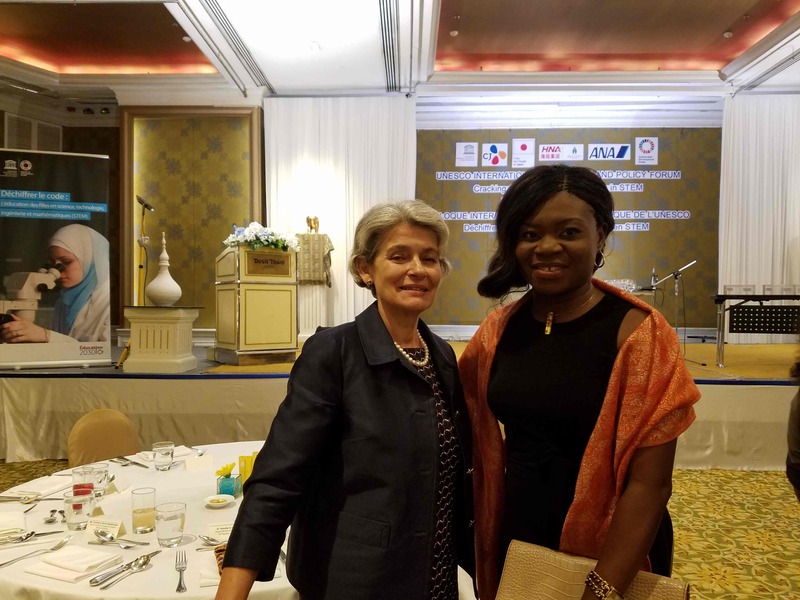 The Visiola Foundation was further invited to present its work at UNESCO’s International Symposium and Policy Forum, “Cracking the Code: Girls’ Education in STEM” in Bangkok, Thailand. Finally, the Foundation participated in the Bill and Melinda Gates Foundation’s inaugural Goalkeepers Meeting on the sidelines of the United Nations’ General Assembly in New York. Take a walk with us as we review our activities during the third quarter of 2017. 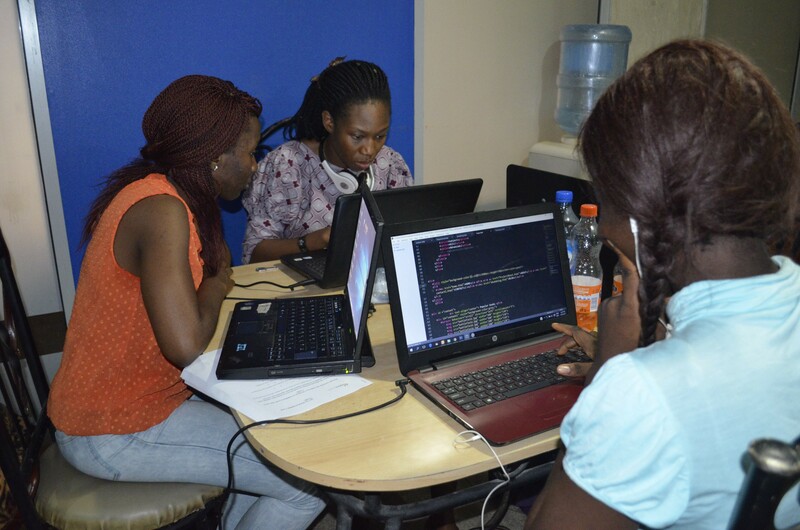 The Visiola Foundation’s 2017 Summer Coding Boot Camp trained 50 young women aged 17 – 30 in various programming languages. Students learnt Full Stack Web Development, Python, MySQL, PHP, Graphic Design, Mobile App Development, and how to interview successfully. 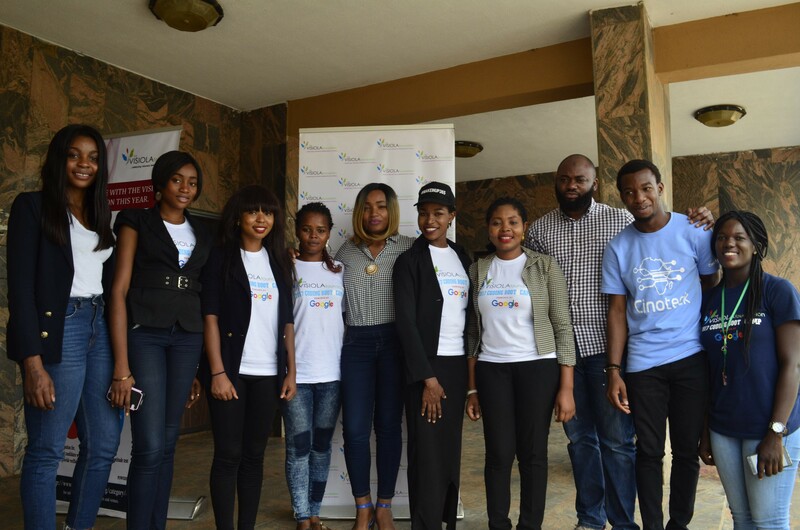 They further received direct mentoring from seasoned IT professionals, including Ms. Nkem Begho (CEO, FutureSoft Nigeria Ltd); Ms. Mudi Kenney (Software Engineer, Pratt & Whitley); Ms. Yetunde Sanni (Software Developer, Andela Nigeria); Dr. Fidelis Ndeh-Che (CEO, Quanteq Technology Ltd.); Mr. Andy Madaki (CEO, Africa FinTech Network); Mr. Tolu Olayinka (CEO, Cinoteck); and Cellulant. The students were further given weekly challenges to test their learning and were divided into groups to learn team work and problem solving. 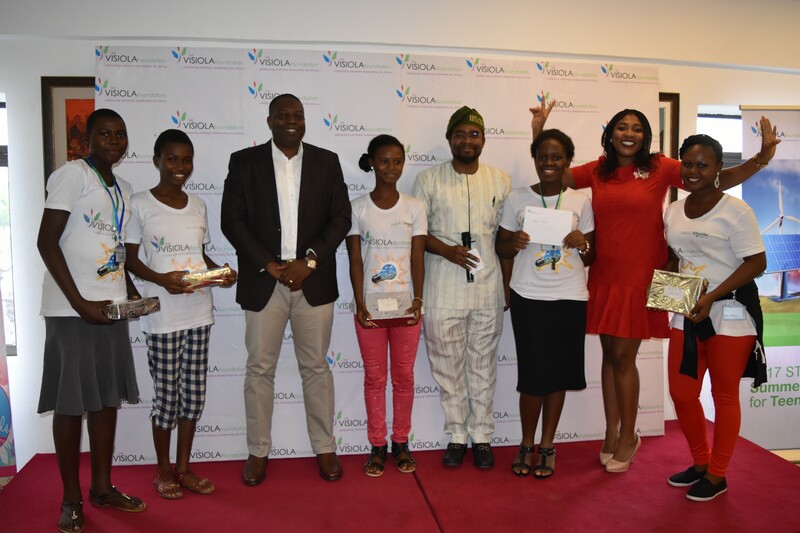 They presented their final group projects to a panel of judges including senior executives from Future Soft Nigeria Ltd., Cellulant Nigeria, and Cinoteck. Projects included a task manager application that manages the schedule of doctors and nurses, car rental portal, library management system among others. Group 3 was awarded for the first prize and received laptops from Cellulant for their project (a school enrolment system that logs all students in a school into selected classes and show the courses offered per student.). Group 6 was the first runner up with their project – a website that displays candidate profiles and portfolios which potential employees can look through and a job database that matches candidates to potential employees. 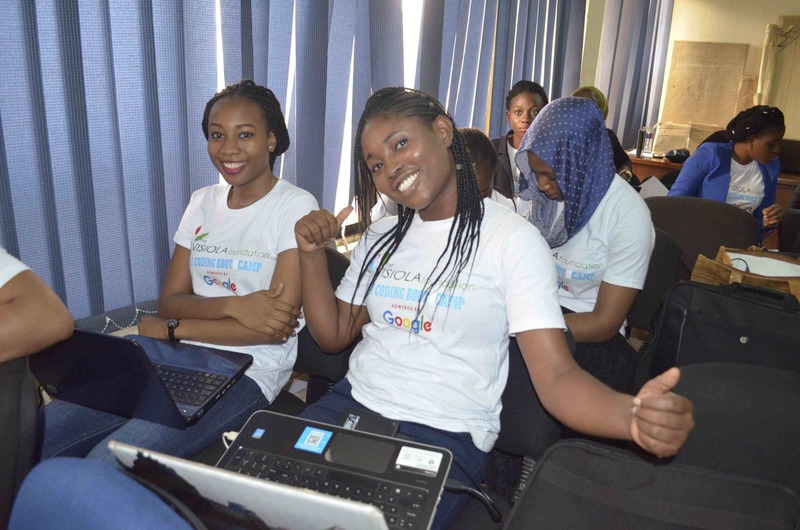 The Visiola Foundation is grateful to Google for its generosity in sponsoring the boot camp and making Computer Science education available to students from underserved communities. 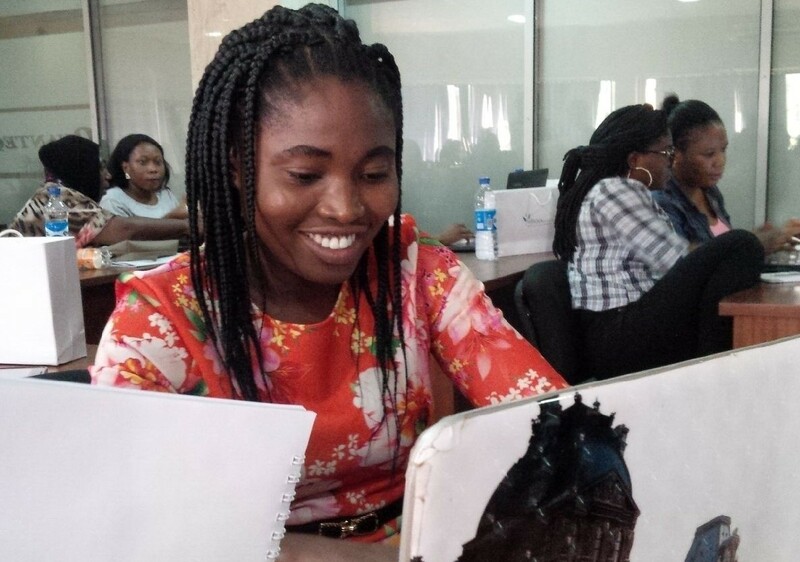 The Foundation has taught 138 young women how to code through its coding boot camp and workshops held in Abuja, Ibadan, and Lagos in the first semester of 2017. 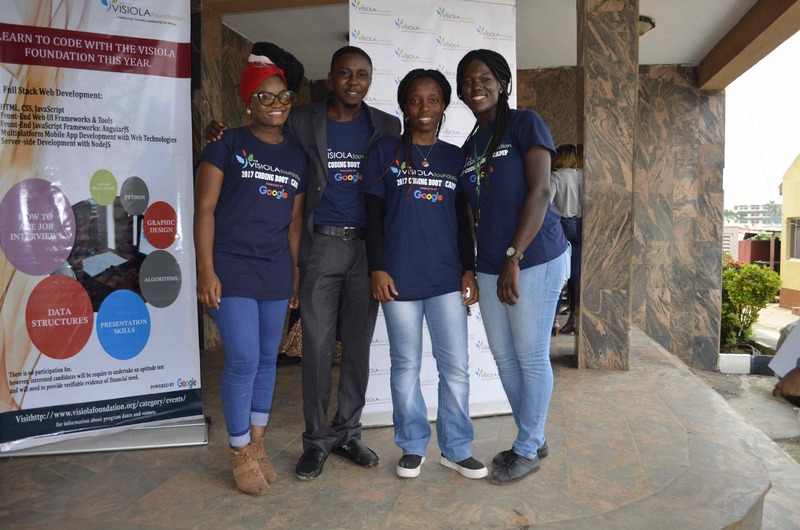 The Foundation also plans to train 100 more through workshops scheduled to take place in Enugu and Accra, Ghana. 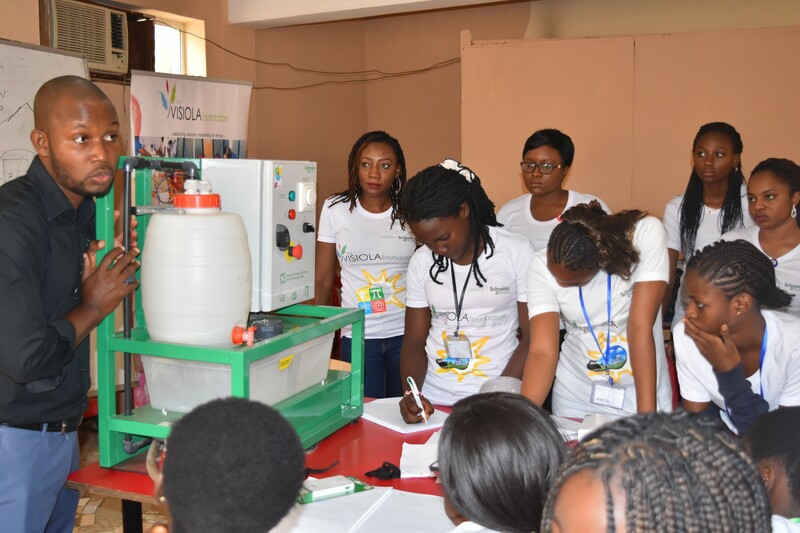 The Visiola Foundation’s 2017 STEM Summer Camp for Teenage Girls exposed 30 students to Renewable Energy. 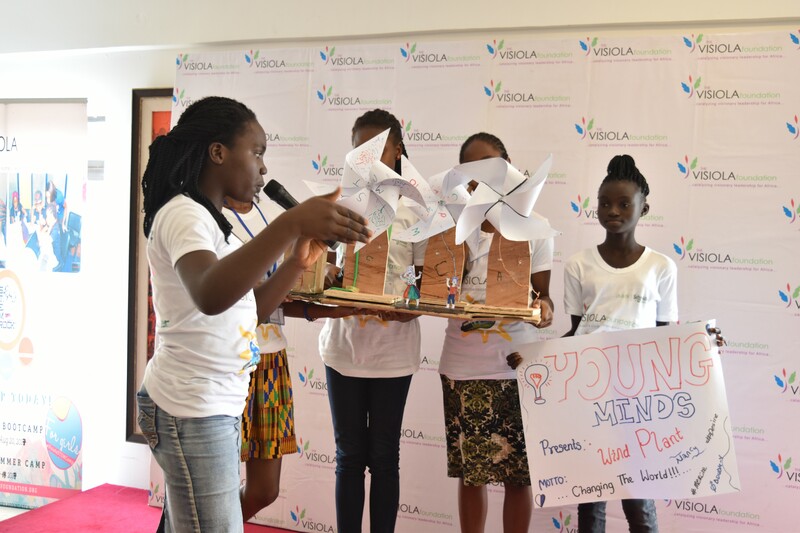 Sponsored by Schneider Electric West Africa, the camp taught students the science and engineering underpinning Renewable Energy and guided them in building solar, hydro, and wind power plant prototypes. They learnt how electricity is generated, transmitted, and distributed to consumers, and were taught the importance of environmental sustainability. The participants were further taken on an excursion to the Katampe Sub-Station where they toured the facility and interacted with the engineers running the operations. 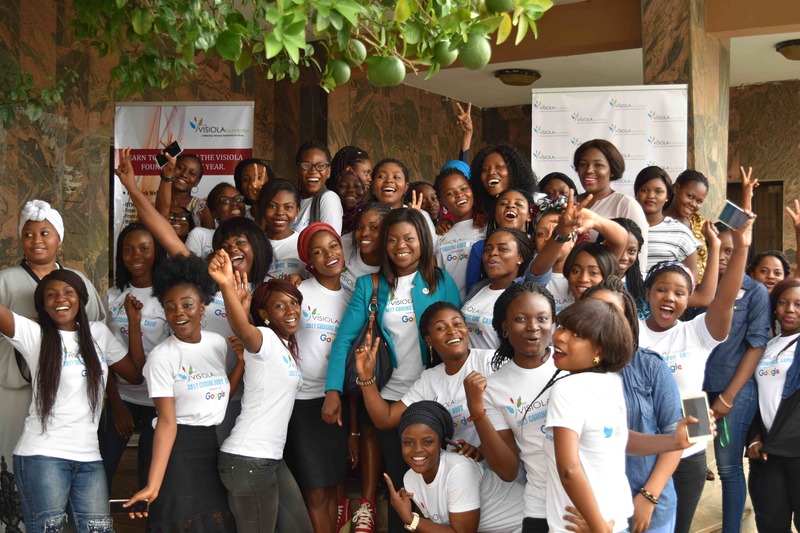 They received direct mentoring from diverse STEM professionals, including Prof. Chidi Onyia (Senior Power Sector Adviser); Mr. Ifeanyi Odoh (Head, Solar Power, Schneider Electric West Africa); Ms. Fele Iweibo (Project Manager, Invensys – Schneider Electric); Ms. Belema Koleoso (Solutions Architect, Schneider Electric); Ms. Viviane Mike-Eze (Head, Communications, Schneider Electric West Africa); Dr. Ozak Esu (Electrical Engineer, Cundall UK); Mr. Murefu Barasa (CEO, EED Advisory); and Mr. Seun Solesi (COO, Abiba Solar Power). The student teams presented their final group projects to a panel of judges comprising, Dr. Debisi Araba (Africa Region Director, International Centre for Tropical Agriculture); Mr. Babatunde Akinola (Head, Intel Semiconductor West Africa); and Ms. Tolulope Falola (Head, Oil & Gas, Schneider Electric West Africa). 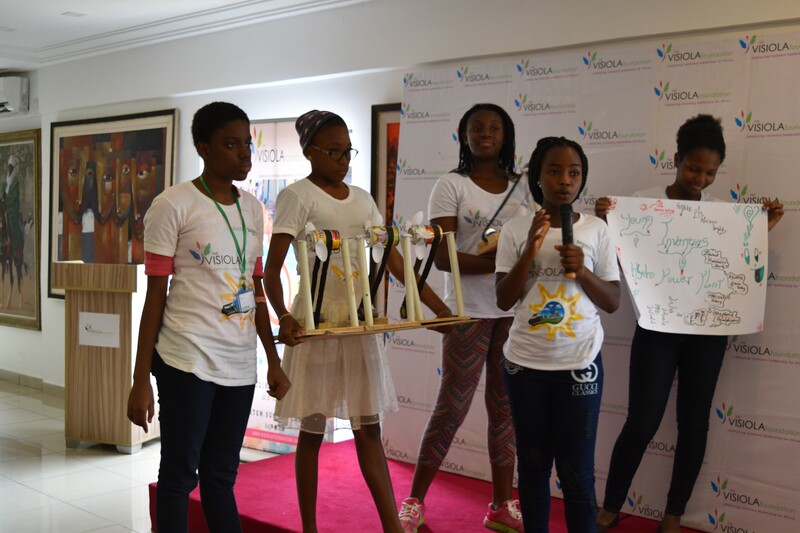 Team Explorers came first with their hydropower generation prototype, while Team Solar for Africa came second with their concentrated solar plant prototype and their solar oven. 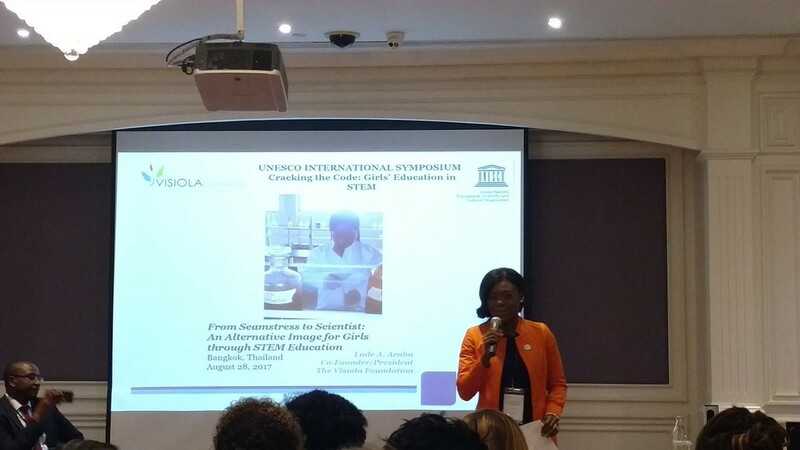 The Visiola Foundation was invited to present its work to provide STEM education to African girls at the United Nations Educational and Scientific Organization’s (UNESCO) International Symposium and Policy Forum, “Cracking the Code: Girls’ Education in STEM” in Bangkok, Thailand on August 27, 2017. 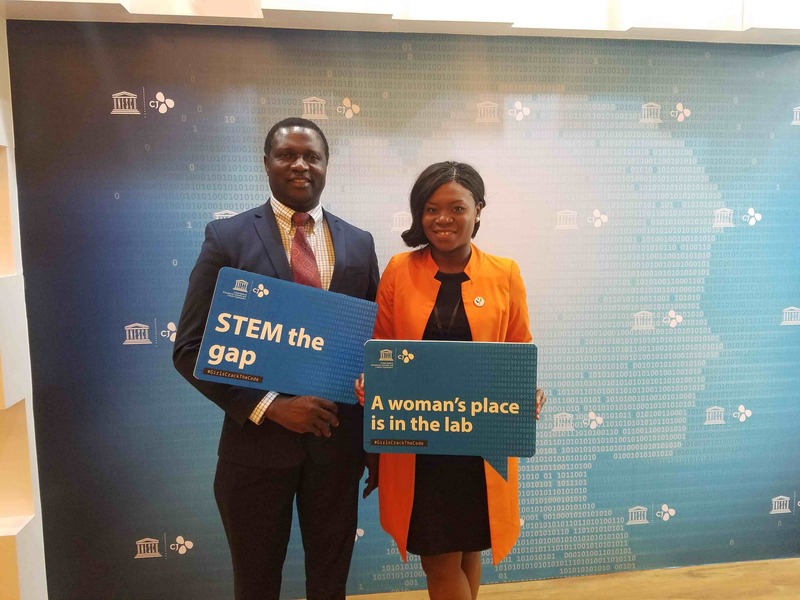 Represented by Ms. Lade Araba (Co-Founder/President), the Foundation shared lessons from its programs designed to upgrade the aspirations of African girls through its presentation titled, “From Seamstress to Scientist: Creating an Alternative Image for Girls. 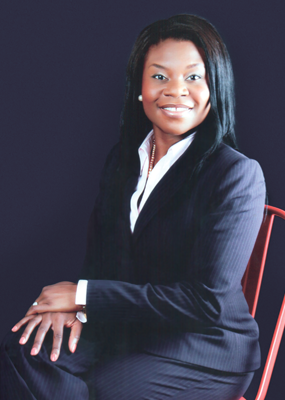 In her presentation, Ms. Araba discussed the sobering statistics from Nigeria and Ghana; which show that women remain marginalized and more disadvantaged by their male counterparts, only achieving 87% of the human development outcomes, as highlighted by the United Nations Development Program’s (UNDP) 2016 Human Development Report. She further shared lessons from the Foundation’s diverse STEM programs, where participants reported that learning a trade (such as sewing) was the primary career path offered to them by their academic institutions and families. She discussed the transformation of students who were exposed to computer programming and robotics at the Visiola Foundation, who subsequently improved their overall academic performance, became more confident in their own abilities, and who subsequently expressed interest in pursuing careers in science, technology, and engineering. 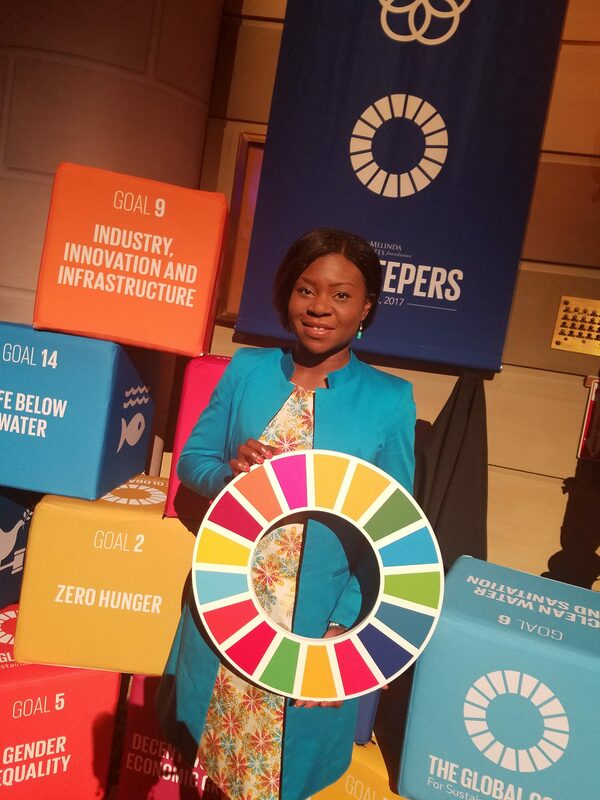 The Visiola Foundation was invited by the Bill and Melinda Gates Foundation (BMGF) to attend its inaugural Goalkeepers Meeting in New York City on September 20, 2017 to share lessons and progress being made towards achieving the 17 Sustainable Development Goals (SDGs) by 2030. 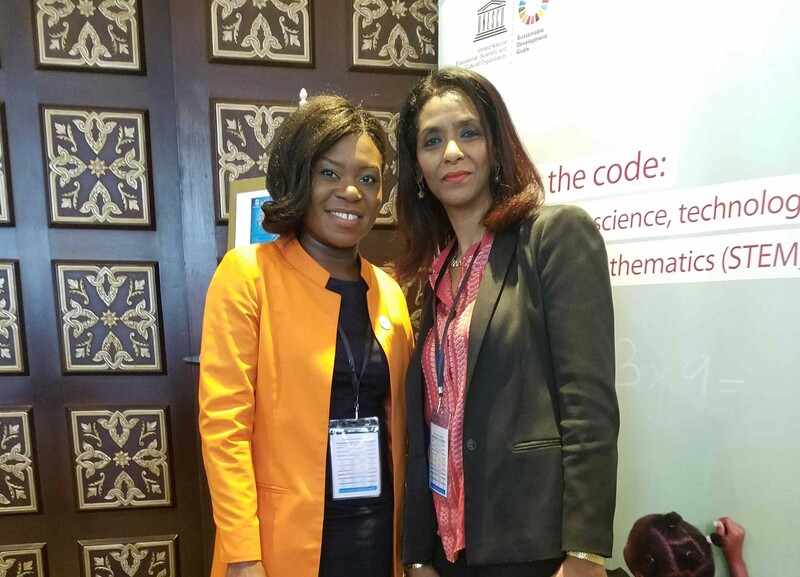 The Meeting brought together over 200 delegates from around the world to discuss the work to educate girls and to make STEM education accessible to low-income and marginalized communities. During the meeting, philanthropists, Bill and Melinda Gates shared their vision for making the world a better place for everyone. Speakers included Bill and Melinda Gates, former U.S. President Barrack Obama, Malala Yousafzai, Sir Stephen Fry, Astro Teller, Amina Mohammed, Leymah Gbowee, and others. Musical icon and philanthropist Will.i.am spoke about his nonprofit organization, I Am Change, which empowers at-risk youth with STEM education. As reported by Bill and Melinda Gates, in the release of the annual report, “In 2015, the member states of the United Nations adopted the Sustainable Development Goals (SDGs), which together paint a picture of what we all want the world to look like in 2030. However, if we don’t reaffirm the commitment that has led to so much progress over the past generation, that world will remain out of reach. Leaders everywhere need to take action now to put us on the path we set for ourselves just two years ago. Kindly visit http://www.globalgoals.org/ for additional information. 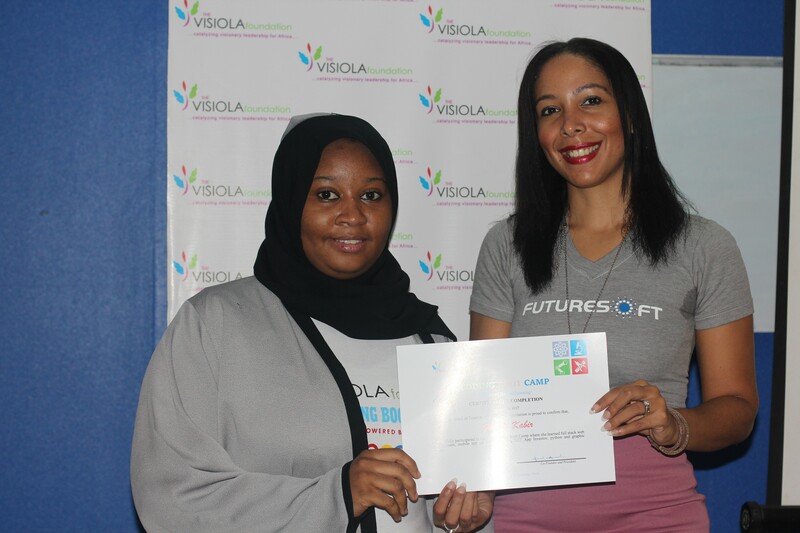 Mrs. Nkem Begho (CEO, FutureSoft) hands Farida her Certificate of Completion. My name is Farida Kabir and I am a budding computer programmer. 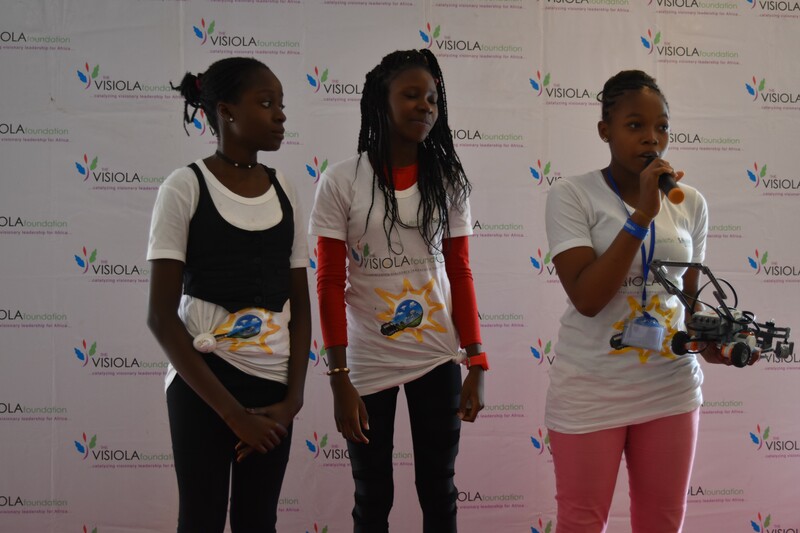 I started my programming journey three months ago when I enrolled for the Visiola Foundation’s Coding Boot Camp for Girls. I had no prior experience. The mere thought of the word “programming” scared me. I really thought I needed to have an Einstein type of IQ in order to learn. However, I decided to confront my fear head-on, taking it one step at a time. A week after the boot camp ended, I got my first contract to develop a website for an NGO. Two days later, I attended a developer’s meet up, ForLoopAbuja, where I met the CTO of a Lagos based startup, and I was offered a position in their remote internship program. Five days later, I received a call from Jamifat Concepts Ltd, an Abuja based Media Promotions Company and eventually joined the company as the IT Director. My role at Jamifat Concepts Ltd. is to work with the team to develop and implement strategies that will increase visibility of the company’s clients online. This includes developing and managing websites, making designs (posters, infographics etc. ), and digital marketing. 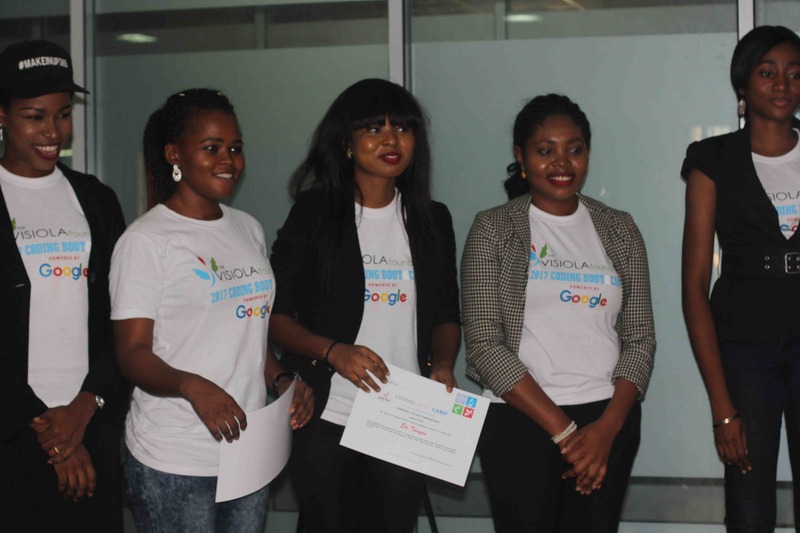 Catherine Agubata and Rebecca Ekong, participants in the Visiola Foundation’s 2017 Summer Coding Boot Camp secured employment as software developer interns at Quanteq Technology Services Ltd. Rebecca narrates her experience below: “I found out about the Coding Boot Camp at a time when I thought I would never be able to build on the basic programming knowledge I had gained in school. 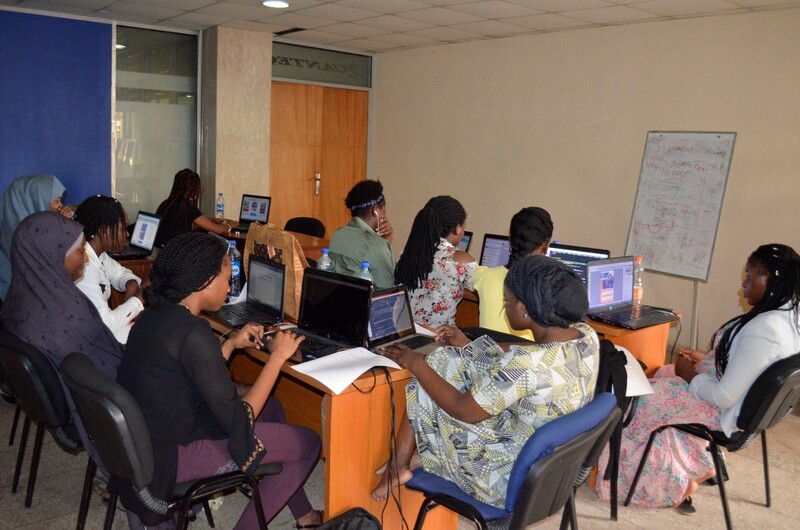 I was captivated by the fact that the boot camp was for young women and that it would provide an environment for them to learn web development. The course content was very rich as it did not only cover web development but included soft skills. It was quite hectic but I was determined to finish it and I did. The Pow-Wow mentoring sessions gave me a lift when I was weak. The facilitators ensured that no one was left behind during each session.